I’m happy to share my expertise with regards to food and wine, in hopes that I can help others increase their level of culinary enjoyment. Some wine/food combinations I’ve discovered are down right mind blowing and taste bud tantalizing. 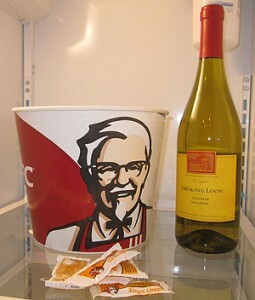 One great combination I’ve discovered is the KFC Original Recipe chicken pairing with a 2008 Smoking Loon Viogneer. The subtle spices in the extra crispy are enhanced and supplemented by the Viogneer, but not overpowered by it. Between chomps of this tasty combination, the KFC coleslaw provides a nice, sweet change of pace and resets the palette.